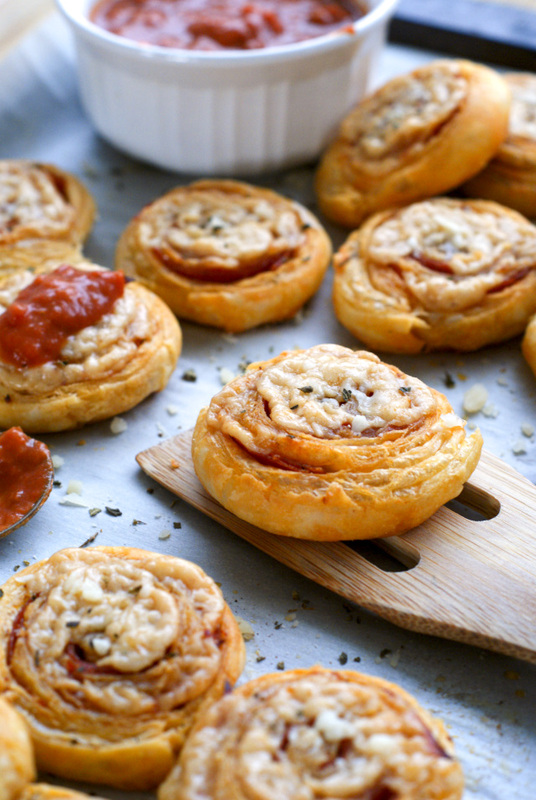 Pepperoni and Asiago Pizza Pinwheels are so easy to prepare, making them perfect for parties, game day, and holidays. They are always a hit and the first appetizer to disappear! Whenever we go to someone's house for a get-together, I always feel like I should have something in hand to contribute to the party. Kind of like a hostess gift, I guess you could say. Whether it be an appetizer, some flowers, or a bottle of wine, even if it's not requested by the host, I like to bring something. And if I don't? I'll sit there all night and feel bad for not contributing. Odd, I know. I'm a strange cookie sometimes. 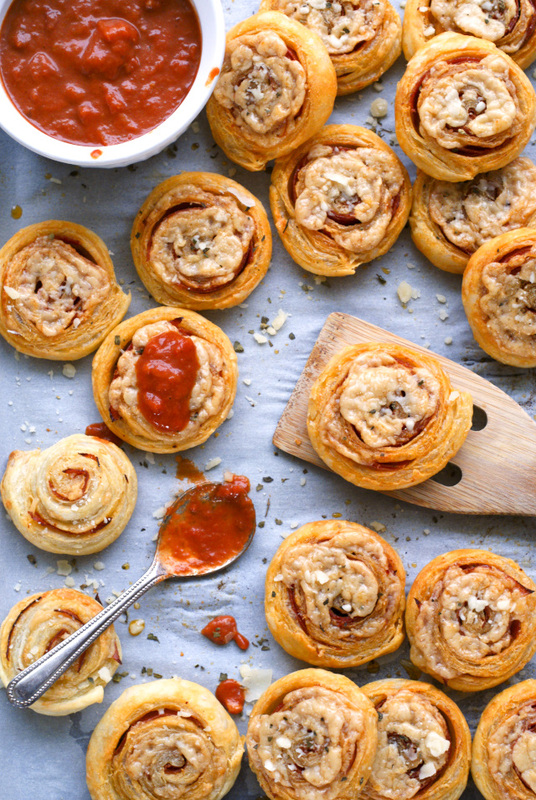 But, showing up to a party with a plateful of something like these Pepperoni Pinwheels makes me happy, and it usually makes everyone at the party happy, too, so be it! I recently brought these tasty little numbers to my Mom's house as a Christmas dinner appetizer. I know that pizza flavored things aren't usually custom for Christmas, and we were having prime rib and twice baked potatoes for dinner which totally doesn't go with pepperoni pizza anything, but in my mind it all made sense. See, we always had stuffed shells for Christmas dinner when I was growing up, and now that we're grown, stuffed shells are what my sisters and I serve to our families on Christmas. Now Mom hosts a separate Christmas dinner at her house, and since my sisters and I serve stuffed shells at our own houses, she's switched to prime rib so we don't have two of the same dinner in one week. I'm not complaining, though! Prime rib and stuffed shells in the same week? I'll take it! How does that all explain the reason why I decided to bring these pinwheels to Christmas dinner? I figured if we weren't having the traditional stuffed shells at my Mom's house, I'd bring those familiar Italian flavors to the menu in an appetizer. For traditions sake. Or maybe I just love pepperoni pizza anything, anytime. Christmas pizza should totally be a thing, no? Ha! These little pinwheels are actually super easy to make. 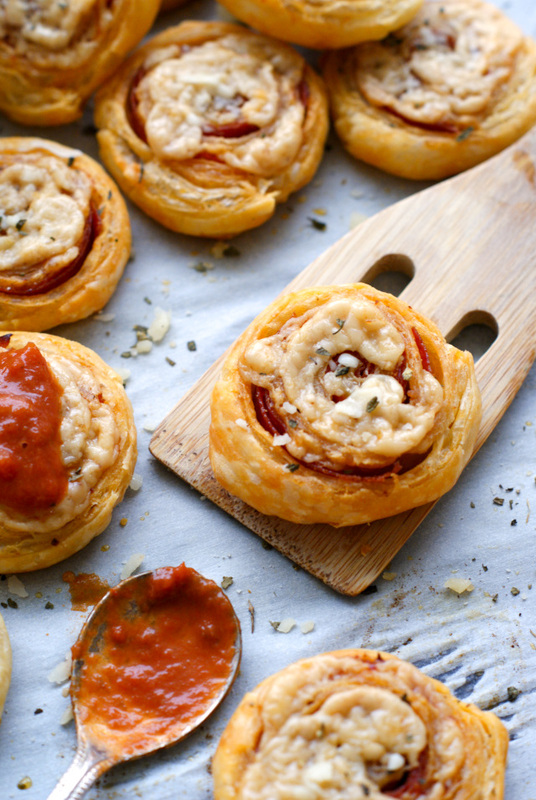 All you have to do is roll out some flaky puff pastry, then load it up with the cheese and pepperoni. 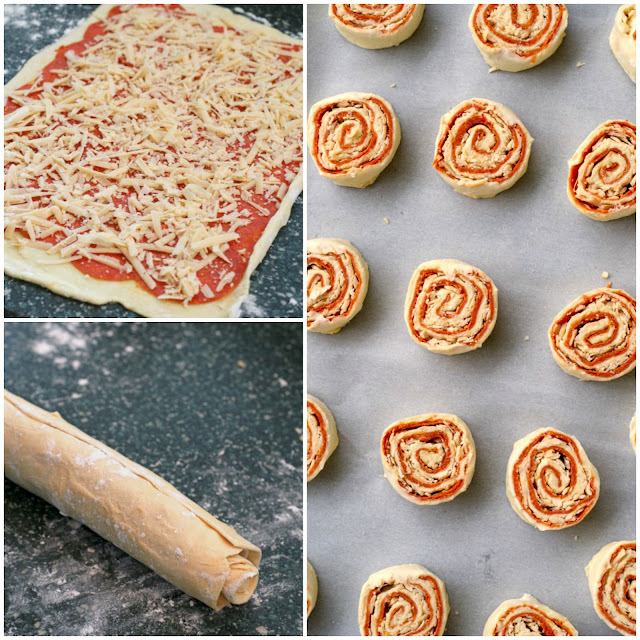 Roll, slice, bake and serve with pizza sauce! My family devoured them and I'm sure your will, too! On a floured surface, roll out the pastry to a 12x15 rectangle. Arrange the pepperoni evenly over the pastry, leaving a 1/2-inch border around the edge. Sprinkle the asiago cheese evenly over the pepperoni. Starting with the long edge, tightly roll the pastry jelly-roll style. Use a little water to brush the seam and pinch to seal. Tightly wrap in plastic wrap and freeze for 20 minutes. Preheat oven to 375 degrees. Unwrap and slice into 1/2-inch slices. Arrange on a parchment-lined baking sheet and bake for 15 minutes. Garnish with grated parmesan cheese and dried oregano and serve with pizza sauce for dipping. I have eaten these served hot right out of the oven and at room temperature. Both were great! We love the asiago, but I'm sure you could switch out the cheese with another variety if you'd like. I've always used asiago, though, and kids and adults both love them! If you're serving a crowd, I definitely recommend doubling the recipe. I made one batch for a party recently and they disappeared in seconds!